Who dares text me while i'm ordering!?. Ahh breakfast food...The very bane of my diet.. Have I ever mentioned that bacon is one of my all time favorite foods..? (Probably every chance I get)I really love restaurants that serve all day breakfasts. Sausages, ham, tapa, tocino, and longganiza at any time of the day? Genius. No need to whip up some fancy baked/roasted dish for me when there's something quick and easy you can just unwrap and sizzle up. It's not the healthiest thing in the world, I know, but like I said, i'm a simple eater. Maybe that's why Diners such as Denny's appeal to me so much. Food with no complications. Slap the meat on the hot plate and fry away. Just the way god meant life to be. And that is precisely why I was eager to try, "Flapjacks". It took me awhile to figure out what I wanted to order because everything looked and sounded so good! Because of my aversion to fruits (due to my acids, among other reasons) I don't usually go for fruit shakes. Milk shakes, yes yes yes, Fruit shakes, no no no. Rina though, loves both. 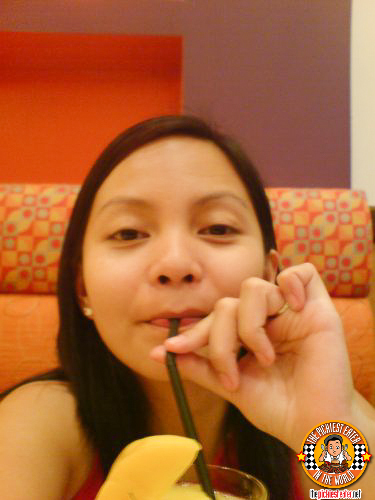 She ordered her usual Mango shake, and seemed to really like it. 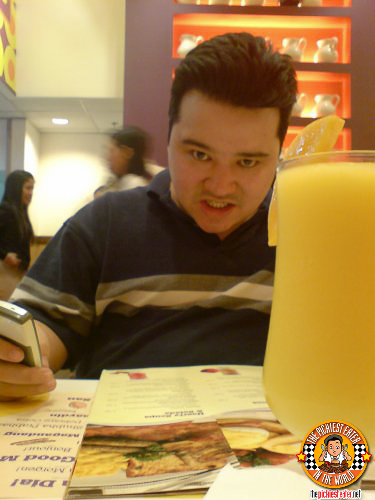 I'm guessing it tasted like your standard issue Mango Shake: Mango, Crushed Ice, Milk. Blend. how much different could it taste from the others? 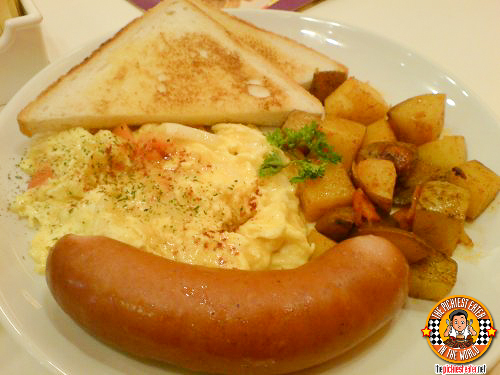 Rina, being the sausage lover that she is (No jokes please), ordered the Schublig International breakfast (P295). 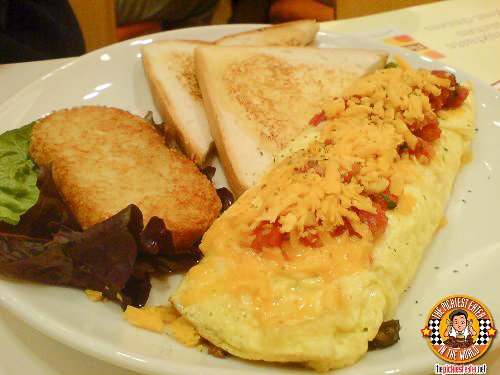 The cheese omelette it came with was nice and creamy, and the bread was perfectly toasted. I really enjoyed their griddle potatoes as well, which was cooked just right and had the perfect softness to it in every bite. My problem with it stemmed from the Sausage itself, which to me, tasted like a glorified jumbo hot dog (which it technically is). The sausage had a nice crack to it when you take a bite, and the meat was actually tasty, but to me, it just tasted too close to a hot dog for me to really appreciate it. Even the texture and feel was too similar. (Again, no jokes please) Rina though, was perfectly fine with it, because it was pretty much what she was expecting anyway. Too bad I don't eat salsa. Too bad I don't dance it either. But that's another story. I ordered the Rib Eye Steak Omelette (P365). As soon as they plopped my order down in front of me, I knew I ordered the wrong dish. I guess I read "Rib Eye" on the menu for that much money, and I was sold. Apparently they put a tomato salsa on it that I can't eat, so I had to scrape it off before I could attack the omelette. Which was a shame because it had a generous sprinkling of cheddar cheese on top of it. The Omelette, however, was quite delicious. The meat was soft easy to chew, meaning they didn't scrimp on the kind of steak they used. The actual egg could've used a little salt, but i'm not holding that against them so much because assuming that if I had eaten the omelette with the salsa, it would've been just right. (See? I'm fair) But to me, the real star of the night were the hash browns. Flapjacks has one of the best Hash Browns i've ever tasted. I'm serious. There's an almost "meaty" taste to it that makes having only one bite virtually impossible. Definitely not something you get from "Frenchies". It was a rather large order, so Rina and I had to share, (Actually that was just my excuse to get her to give me some of her Shublig hehe) making the price rather worth it. I went back with Rina a few months (but to the Greenhills Branch this time) later realizing that I hadn't tried their other breakfast dishes. It took me quite awhile to decide what I wanted to order the first time because I wasn't sure what to expect. This time I knew more or less what I wanted. A little bit of everything. That problem was solved when I ordered the All American "Slammer" (P395) which consisted of Two strips of Bacon, An egg (Any style you want), two pancakes, two sausage links and Two Hash Browns! The Bacon was smokey and cooked just right.. not too crispy but not soft either. The eggs, however, were again a tad bit bland, but again, i assumed that since there was going to be an explosion of flavors in your mouth, the addition of the egg was a mere formality to round up the breakfast meal. (What the hell does that mean?) Apart from the eggs, the only qualm I had with the All American Slammer was the pancakes. For me, the true mark of a pancake's awesomeness is how it reacts to maple syrup. If the syrup slides off and practically envelopes it, then you've got yourself a winner. But if after pouring the syrup all over the pancake, and the syrup is absorbed into the pancake by the time you put the container down, then expect at the very least slight disappointment. (And they said I wasn't any good in science). The funny part was, I thought I was suffering from short term memory loss. "I could've sworn I just poured syrup over this... heyyyy... why is my pancake heavier than normal?" Thinking back, I can't remember if the Slammer actually does serve two Hashbrowns or I just swiped one from Rina when she wasn't looking hehe. Honestly though, I do wish they thought up of a better name of their breakfast dishes, because "Slammers" are an obvious rip off of Denny's "Breakfast Slams". 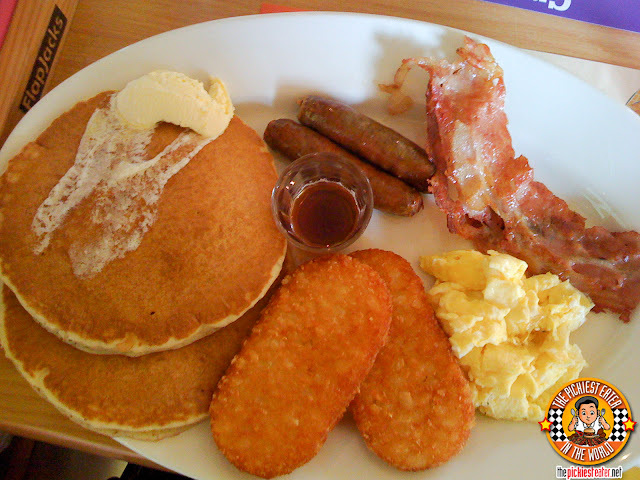 I've been back to Flapjacks another time since then and had the French Toast, which I found a bit bland. However, when I passed by there just a few days ago, I took a look at their menu and saw they made some new changes. They now have "Muffin meals", a new lineup of burgers, and a wider entree selection that includes BBQ Pork Ribs! I plan to go back soon to finally try their Hash Brown Burger.. If you saw what I did with this QUARTER POUNDER, you know I'm gonna like this!